It is late November and I have JUST finished my first quilt of the year. SAD!! I have to complete 2 more before Christmas, and if I have time hopefully I'll get a few more quilted and bound. 1 - that I haven't started that I NEED to finish before Christmas! So let's talk about the finished one! I made this for my sister and husband as a wedding present. Her favorite color is purple, his is light blue. They are both doctors and both of their names start with a T. You'll maybe even remember this inspiration from back in September when they eloped. Image 2: The multiple shades of purple solids (and the light blue solids). I think I used 8 different solids. Image 3: These look like lower case T's, or maybe a medical cross. I mixed in some upper-case T's as well. I didn't follow a pattern, just went for it and used a stack & whack method. My blocks ended up being 8" square finished, 7 across, 9 down. I played around with the layout a lot - where to put their names (same line? One top, one bottom? Facing each other?) and how to arrange the colors (random? dark to light? purples to blues?). This is ultimately what the boy and I came up with. On the back I pieced in a big wonky star and surrounded it with flannel (snuggly for Boston winters). 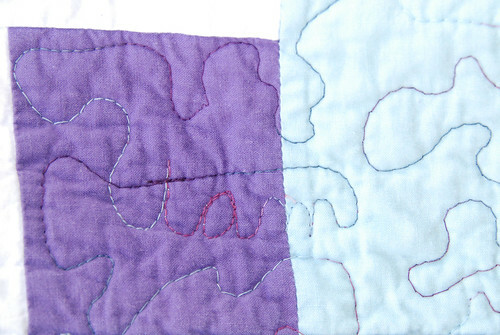 I quilted it with a blue/purple variegated thread that was PERFECT! At first I tried free-motion all over, but it stood out too much on the white parts. So I ripped it out and only free-motioned in the colored spaces. A bit tricky at times!! I forgot to drop the feed dogs while quilting this. You'll be pleased to know (well, I am at least) that it didn't make much difference. 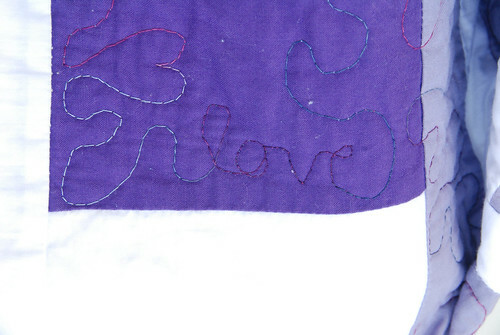 I don't know if they'll notice, but there are some hearts throughout the quilt. Nothing too mushy, but (hopefully) cute. 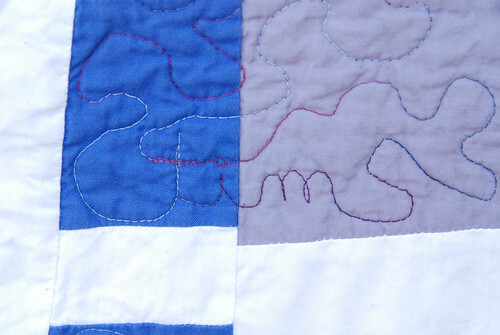 I also quilted in "love", "tam" and "tim" in random placed. Just fun little details. 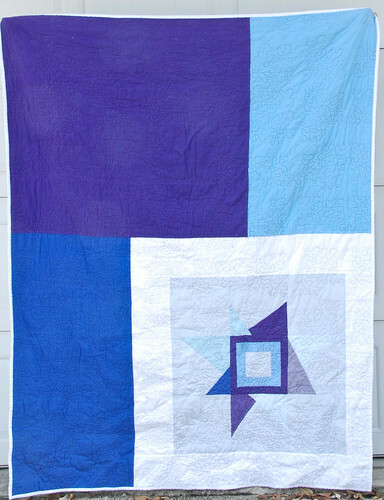 They are expecting a daughter in March, so you'll be seeing more quilting for them soon! 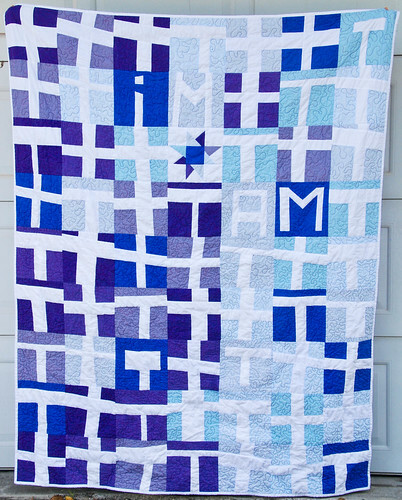 this quilt is clever in every way. Very nice! What a great gift, so personal. An heirloom for sure! It's beautiful!! 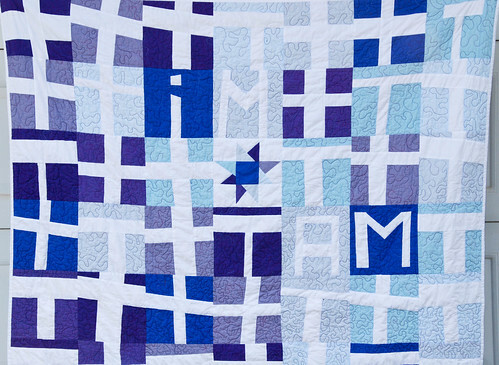 I'm in awe looking at all the free motion quilting! This is a beautiful gift and I love your free motion - I must give it a go sometime.